Louisiana is quite the interesting state, with a unique, multicultural and multilingual heritage. You’ve got cajun cooking, Mardis Gras, and swampy lands. The wildlife here is very diverse, as is the plant life. People love to come here for the food and rich culture, especially in the New Orleans area. Louisiana is the 4th largest volume shipping port in the world, and the largest supplier of crawfish. Louisiana has had its share of hardships, due to it being prone to flooding as well as tornados. The strong sense of heritage here though creates tight communities that can be quite safe to live in. There are 6 cities here that made it onto the top 750 safest cities in the nation. The most notable cities in Louisiana, New Orleans, Baton Rouge, and Lafayette all made the list. Half of the safest cities within the state have a safety rating above 60. 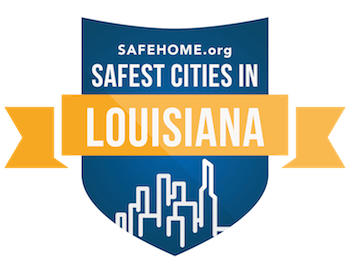 Mandeville is the safest city in Louisiana on our list, with a safety rating of 81.46, and is located across the large lake from New Orleans. It has a population of 12,306 and has a remarkably low amount of crime, that has not grown or declined in recent years. The median income here is $70,043 for a family, which signals this city has one of the state's more affluent populations. As for the big cities, New Orleans has a safety rating of 65.55, Baton Rouge is at 62.72, and Lafayette at 59.09. As you go more central into Louisiana, the safety rating drops like in Alexandria at 31.06. Further west towards the Texas border though, the safety rating increases again like at Lake Charles with a rating of 65.05.